Join us for the 27th Annual Taste of Amherst Father's Day Weekend June 13-16, 2019 on the Amherst Common co-hosted by the Amherst Area Chamber of Commerce and the Amherst Downtown Business Improvement District (BID) and presented by Atkins Farms Country Market. 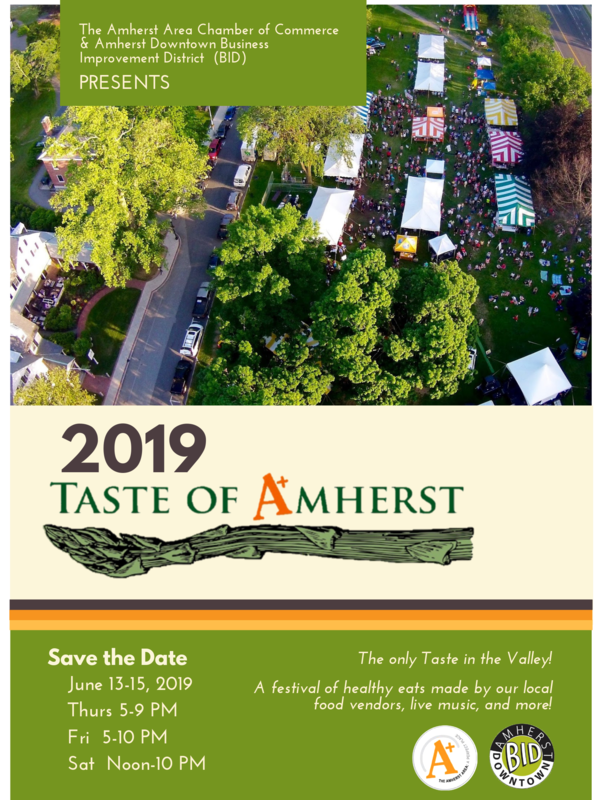 Save the date for this year's Taste: Thursday-Saturday, June 13-15, 2019 on the Amherst Town Commons. Like our page on Facebook to get all the updates on participants and programming! Check us out on Facebook, for up-to-date listings, and news. For over a generation, the Taste of Amherst has established itself as a beloved town and regional institution. The event, organized jointly by the Amherst Area Chamber of Commerce and the Amherst Business Improvement District (BID), and presented by Atkins Farms Country Market, is filled with food, family, and fun! Over the years, the Taste has grown. Now, over 20 Amherst area restaurants participate in the event, showcasing some of the area's favorite food.Once again, the Taste is happy to welcome Chef Bill Collins, who is organizing the Cooking Demo tent. At the beer and wine tent, there will be great beer and wine for your enjoyment on Friday and Saturday evenings. Back by popular demand: our very own “Chow-Down Challenge”! Inspired by committee member Youssef Fadel of New England Promotional Marketing, the Challenge features local offerings from Taste participants, town celebrities and taste-goers, who will compete in our challenge. Bring your appetite! The winners of qualifying rounds will face-off on Sunday in the championship round.